What a difference a year makes. When Apple first released the iPod touch, it was—with its Wi-Fi capabilities and touchscreen interface—much more than an iPod. Yet originally lacking applications such as Mail, Stocks, Maps, Weather, and Notes (and a Calendar application that allowed you to create events) and eschewing external volume controls and a built-in speaker, it was also far less than an iPhone. With software updates, Apple brought the iPod touch’s applications in line with the iPhone. With the second go-round of the iPod touch—introduced Tuesday as part of Apple’s annual fall iPod line overhaul—Apple takes another step in the right direction by adding those two desirable physical features: external volume controls and an internal speaker. Along the way, the company also slimmed down the case and, rounding the iPod touch’s edges in style not unlike the iPhone 3G’s. The price for the iPod touch has been slimmed down as well. Where the 8GB, 16GB, and 32GB iPod touches once cost $299, $399, and $499 respectively, the latest model can be had in these capacities for $229, $299, and $399. They also ship with the latest iPod touch 2.1 software. The touch’s new external volume controls are welcome and perform exactly as they do on an iPhone. Press the top of the rocker switch and the volume goes up. A press at the bottom of the switch causes the volume to decrease. As on the iPhone, applications that bear volume sliders reflect the change in volume by moving up or down as you press the switch. The speaker, however, is regrettably nothing like the iPhone’s speaker. As Steve Jobs said, this speaker is for “casual listening,” which I’d suggest is a fairly generous description. Unlike the iPhone’s speaker, which clearly sits on the bottom left of the device and is fairly directional, the sound from the iPod touch comes from no particular location—it seems to just seep out of any holes on the device. I attempted to watch Chinatown while listening to the audio only through the iPod touch’s built-in speaker and I had a difficult time discerning the dialog even with the volume turned all the way up. I had hopes that I could pass this iPod to the back seat so my daughter could watch her favorite movies on long car trips as she now does with my iPhone. Not going to happen. Couple the speaker’s tinny, very low fidelity with the whoosh of car noise and I can’t imagine she’d get much out of it. The existence of the speaker is reflected in the Sound setting (called Sound Effects on the original iPod touch). Here you’ll find the addition of the New Mail, Sent Mail, Calendar Alerts, Lock Sounds, and Keyboard Clicks entries—sounds that play through the speaker. You’ll also hear a camera sound when you take a screenshot of the display by pressing Home and Sleep/Wake. When the iPhone 3G shipped, some noticed that its display had a yellower cast than that of the original iPhone. The new iPod touch’s display is yellower still. Placed side by side with an original 16GB iPod touch with the brightness cranked up on both, the new iPod’s display appeared slightly dingy in comparison. Take the old iPod away, however, and you quickly adjust to the look of the new one. The new iPod touch’s display (center) is clearly yellower than the original iPod touch (left) and today’s iPhone 3G(right). When you first invoke the Genius playlist you’re presented with a list of all the songs on your iPod touch. One of the marquee features of the new iPod nano and iPod touch is the Genius playlist—a scheme for selecting a track in your iTunes library or iPod and intelligently creating a playlist of related music. 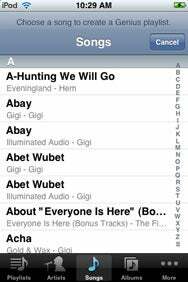 (Read more about the Genius feature in this first look at iTunes 8.) This feature is implemented in a couple of ways on the iPod touch. Most obviously, tap the Music icon at the bottom of the Home screen, tap Playlists, and at the top of the Playlists screen you see a Genius entry. Tap that entry and a list of all the tracks on your iPod appear. 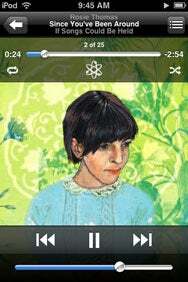 Tap a track and the iPod creates a list of 25 related tracks and starts playing the track you originally selected. You also have the option to create a different Genius playlist based on that same track. Just tap Refresh and the playlist is created. 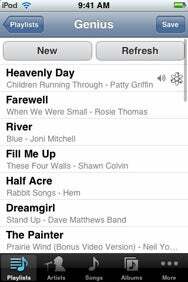 If you like what the Genius has come up with, tap Save and the iPod saves that playlist by the name of the original track—Helter Skelter, for example—lists it in the Playlists screen, and puts the Genius icon next to it to indicate it’s a Genius-generated playlist. When you sync your iPod with your computer, any Genius playlists you’ve created are synced to the computer and appear under the Playlists heading in iTunes’ Source list. After creating a Genius playlist you can refresh it with new material based on the same source song or start over by tapping New. You can later select this playlist and edit it by tapping the Edit button. When you do, a screen scrolls up that reads Refresh Playlist and Delete Playlist. Just how much the playlist is refreshed depends on the tracks on your iPod. If the Genius feature feels it doesn’t have much to choose from you’re going to see a lot of the same tracks appear in the refreshed playlist. The Genius feature is also available from within the Now Playing screen. When playing a track, simply tap on the display to reveal the timeline panel. Below the timeline you’ll find the Genius icon. Tap it and you create a Genius playlist based on that track. This playlist works exactly like other Genius playlists. You can easily create a Genius playlist by tapping the Genius icon on a Now Playing screen. I launched the App Store on an original 16GB iPod touch running software version 2.0.2 and the new iPod touch running 2.1. I asked both to update The Iconfactory’s Twitterific to version 1.1. The new iPod with the latest software did it over my Wi-Fi network in 20 seconds. The old iPod touch with the older software version took an interminable 5 minutes and 2 seconds. I obtained similar results with other software updates. Apple claims that the new iPod touch offers better battery life than the original touch. I haven’t had the iPod long enough to test its alleged audio playback time of 36 hours and video playback of 6 hours, but will as I delve deeper into the device in preparation for my full review.